Sometimes spring seems to switch from downpour to sun-filled skies in a heartbeat, demanding you to take advantage of each dry break and head outdoors. This week, we take on two estuary expeditions for the price of one getaway on Oregon’s North Coast. The Salmon River is a sinuous braid work of channels and sloughs that thread their way toward the sea through a broad estuary of grassy marsh. It is a place worth a closer look! The US Forest Service recently completed the groundwork of the new Salmon River Interpretive Trail along North Fraser Road just off Highway 101 (the Pacific Coast Scenic Byway) and not far from its junction with State Highway 18. It is a fine place to get out, stretch your legs, perhaps enjoy a picnic lunch and stroll a trail that leads to something special. While the groundwork has been completed — picnic tables and rest rooms are in place and a short trail has been completed — eventually multiple interpretive panels will display information about the area’s geology, flora, fauna and cultural significance. The site also will consist of many artistic elements portraying the sinuous tidal channels which are hidden by the marsh grasses, yet dominate the estuary. At the end of the short gravel trail, enjoy the view to Cascade Head, a significant and protected site that is prized for its rare plant and animal life. 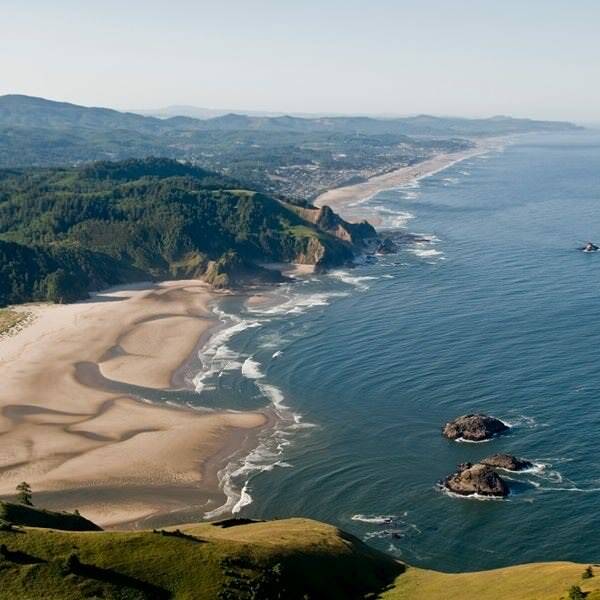 Located between Tillamook and Lincoln counties, the rugged Cascade Head rises to meet the sky. There are multiple trails you can follow to explore the area. I chose the shortest for our hike — just a mile in length — that spans US Forest Service land and reaches nearly 300 acres of the well-known Nature Conservancy’s Cascade Head Preserve, where the view takes your breath away. Cascade Head has been a National Scenic and Research Area since 1974. Few deny it’s one of the finest points of the Oregon coastline. My hiking partner, Don Best, says it makes him feel young again on a day too nice to be indoors. Cascade Head provides awesome views on a day when coastal clouds roll ashore and seem so close you could reach out and touch them. There’s an ethereal feel to the hiking experience. It is gorgeous and a fine estuary expedition you can make anytime, while just 12 miles to the north, another estuary invites you on an expedition that offers a different point of view. 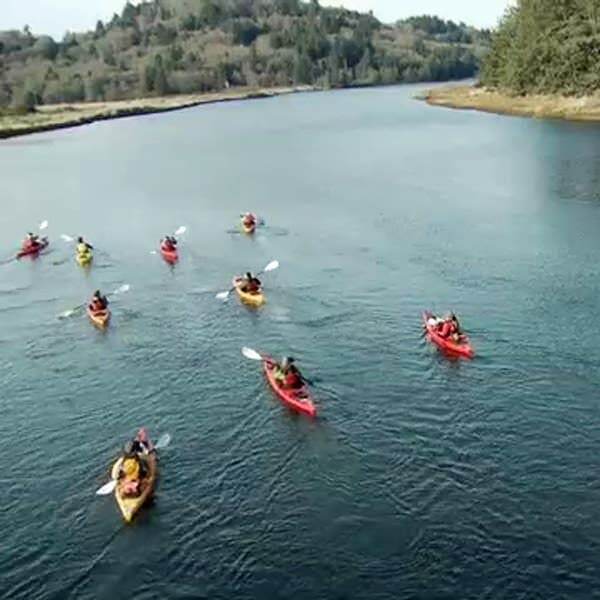 The waterway cuts a beeline thru the Nestucca Bay National Wildlife Refuge, and the trip is so easy anyone can try on a river paddle with local guides that cater to beginners, like Kayak Tillamook. 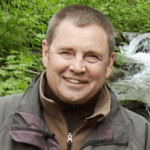 You may see bald eagles, red tail hawks, osprey, deer, elk, beavers, river otters and more. Be sure to dress warm and in layers to accommodate your level of activity. Avoid cotton. Don’t forget a rain jacket cap and gloves. A life jacket is provided and it is mandatory on a trip where safety comes first. We follow our river guides as flocks of Canada geese wing past on their way north. 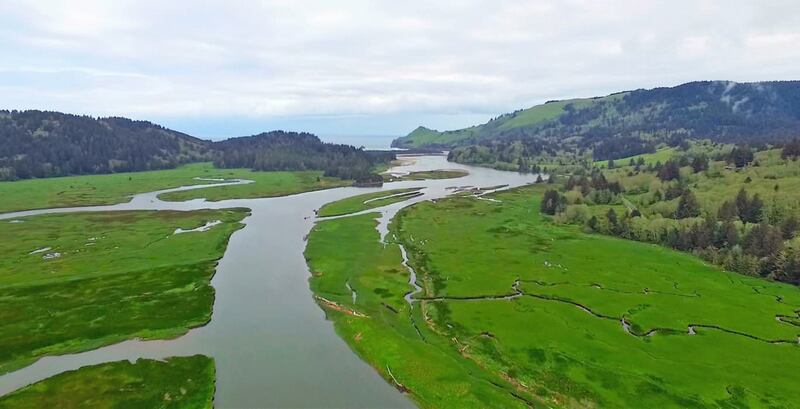 In addition to the Nestucca Bay Wildlife Refuge trip, you’ll be pleased to know that there are more than 800 miles of water trails in Tillamook County that reach across any rivers, estuaries and sloughs. There are even maps to guide your way: Tillamook County Water Trails.